Have you ever wondered what wine to serve with your holiday dessert? Join us at the Farm Winery on December 15th and December 16th from 11am-5pm. Guests can purchase a flight of 3 wines paired with 3 holiday cookies for $12. Reservations are not required–just stop in! And, if you haven’t finished your holiday shopping yet, you can visit some local crafters and vendors in our Pavilion on Saturday, December 15th while you enjoy your wine and cookies. 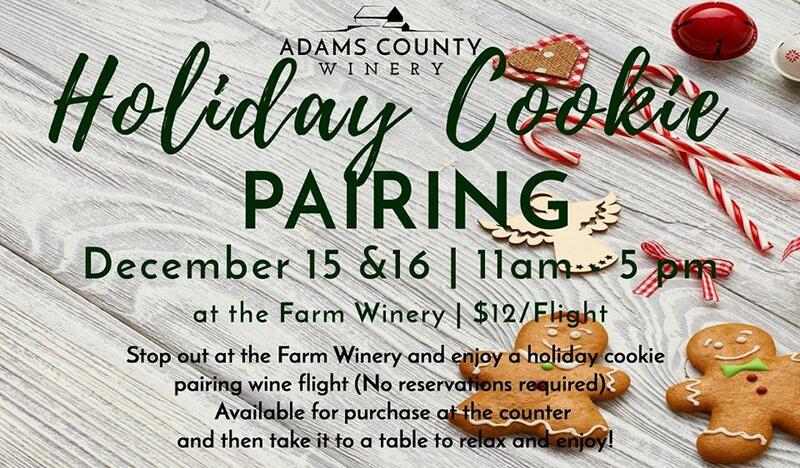 We hope to see you at the Adams County Winery located at 251 Peach Tree Road, Orrtanna, PA 17353!